When you're missing all of your natural teeth on an upper or lower arch, your treatment options are typically dentures and dental implants. While each option has its own set of benefits, dental implants are the only permanent solution that look, feel, and function just like natural teeth. If you're in the San Mateo, CA area and are interested in getting dental implants, Dr. Kinsel and his team will help you get a new smile. They function like natural teeth, allowing you a full and varied diet, even including foods that are difficult to chew. Your taste and temperature sensations are greatly improved over dentures. Full-arch implant bridges are fixed, so they don't impede speech or slip in the way conventional dentures can. Tooth loss ultimately leads to loss of jawbone density, altering your facial structure; dental implants are the only form of tooth restoration that stabilizes bone in your jaw. Getting full-arch implant dental implants typically takes several visits to our San Mateo dental office, and includes collaborative treatment planning, implant placement, and your new fixed bridge. The amount of time the full procedure takes can vary somewhat depending on the individual. In selective cases, the implants and a temporary bridge can be placed in one day using the Straumann Pro Arch protocol. Dr. Kinsel teaches this single appointment technique to other dentists. The first visit is a consultation, at which Dr. Kinsel assesses what's needed to fit and place a full-arch dental implant. This typically involves an oral examination, specialized dental x-rays, impressions, and consultation with our in-office dental laboratory technician. The x-rays are used to determine the best locations to place the implants, and impressions are used as molds for creating the tooth restorations. Next, the implants are placed in the jawbone by our implant oral surgeon. At this stage, there may be a wait of several weeks or months, to allow the implants to integrate into your surrounding bone. 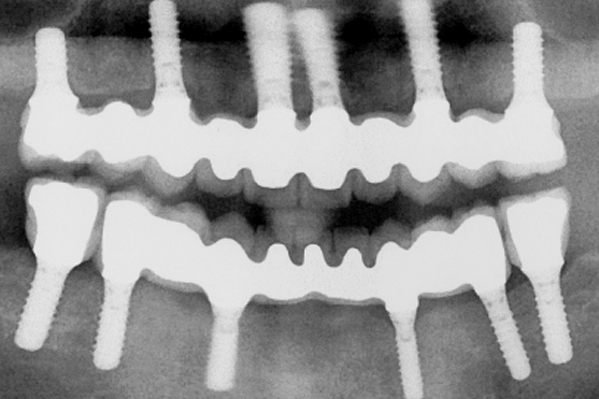 In selective cases, the implants can be fitted with a temporary fixed bridge at this same appointment. Once tissues have fully healed, the permanent fixed bridge is attached to the implants. This last step may require additional visits to ensure a perfect fit and placement. Taking care of dental implants is just the same as normal oral hygiene: twice-daily brushing, daily flossing, and regular visits to your dentist will keep the implants healthy and looking great. For more of our cases, click here. 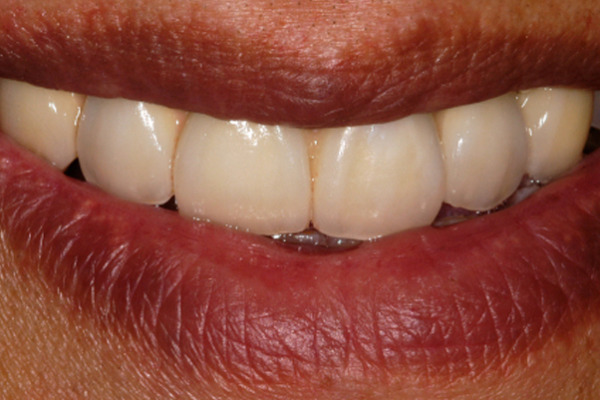 Looking for Full-Arch Implant Fixed Bridges in San Mateo? Contact Us Today! Dr. Kinsel and his implant team have over 30 years of experience in full-arch implant, fixed bridges. To learn more about full-arch dental implants, or to schedule a consultation or appointment please give us a call.